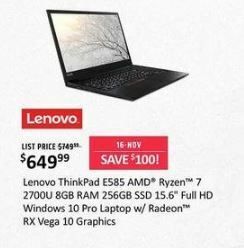 Shop for great discounts on Lenovo laptops, tablets, desktop computers and other electronics at Lenovo’s Black Friday sale in 2018. 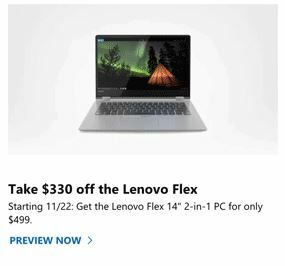 We will post the Lenovo ad with all of the best deals and price savings here when it is available between Thanksgiving and Cyber Monday 2018! Daily doorbusters kick off daily from 11/19 to 11/27, with free shipping, no hassle returns, no interest financing available, and offers for small businesses throughout the week. Lenovo offered Pre-Black Friday Doorbusters of up to 39% off on select laptops. For Black Friday, Lenovo offered up to 67% off site-wide including big savings on tablets and certain laptops. Other products on sale included monitors, desktop computers, headphones and some other electronic products. Many of the deals (and a few new ones) continued on to Cyber Monday. Lenovo also circulated a separate sale flyer for small businesses. Lenovo is a Chinese computer technology company with headquarters in Beijing, China and Morrisville, North Carolina. It was the largest personal computer vendor by unit sales in 2015. The company was founded in 1984 and acquired IBM’s personal computer business in 2005.